In an 1811 letter to his granddaughter Anne Cary Bankhead, Jefferson cited an often-quoted passage that perfectly described the beauty of his Monticello flower gardens: “…the flowers come forth like the belles of the day, have their short reign of beauty and splendour, and retire, like them, to the most interesting office of reproducing their like.” Known for his year-round colorful display of foliage at Monticello, Jefferson favored bulbs for their hardy durability as well as their variety. 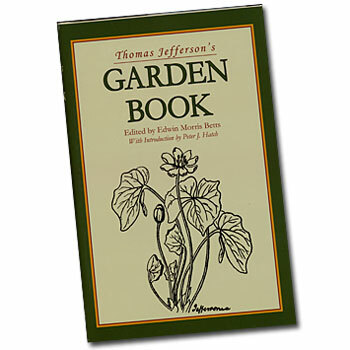 For nearly sixty years Jefferson kept records of the progress of his blooms, specifically his favorite bulbs, in his Garden Book. Many of these flowers were featured in his “Calendar of the bloom of flowers in 1782,” which was Jefferson’s attempt to graphically represent the overlapping blooming seasons for various bulb flowers. Many bulb species bloom as the fall foliage begins to change color. If planted correctly, the cooler Autumn temperatures trigger fall bulbs to begin flowering in your yard or garden. Many fall bulbs sprout chromatically stunning flowers that enhance the Autumnal color scheme. 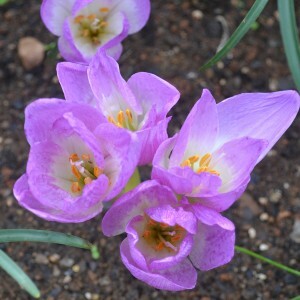 The Byzantine Autumn Crocus bulb generally grows 4-6 pale pink flowers appearing in early fall. Their delicate color is an unexpected pop of pink in a fall color scheme dominated by reds and yellows. 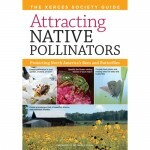 All parts of the flowers are highly toxic, making these bulbs deer and rodent resistant. The False Autumn Crocus adds both hue and fragrance to any outdoor area. This fall-flowering bulb blooms fragrant lilac-purple flowers with white throats and orange anthers. The blooms form a chalice-like shape and yellow as they mature. For visual diversity, introduce hyacinths into your fall garden. The Feathered Hyacinth and the City of Haarlem Hyacinth feature fragrant, feathery plumes that grow anywhere from 8-12 inches. 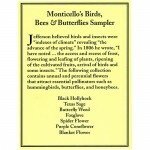 The Feathered Hyacinth sprouts tiny, delicate violet petals while the Haarlem Hyacinth grows large, highly scented flowers in primrose yellow. 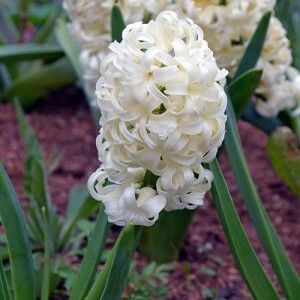 Jefferson recorded planting the popular hyacinth bulb, including these two species, in his Monticello gardens in four colors– pink, yellow, white, and blue. 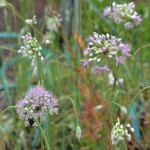 A true American favorite, the Autumn Prarie Onion is a quirky, unique flower that adds a whimsical touch to a fall garden space. Its central stalk shoots clusters of pink and lavendar flowers outward, creating an unconventional firework effect. Native to praries in the American midwest, the Autumn Prarie Onion was first documented in the early 1800s. It requires little water to survive, making it one of the hardiest fall bulbs available. A fall garden isn’t possible without the right tools! For easy bulb planting year-round, check out The Shop’s Stainless Steel Bulb Planter, which is endorsed by Britain’s Royal Horticultural Society. 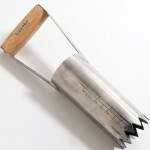 Its deeply serrated edge cleanly removes a 2 1/2 inch diameter core. Keep pesky weeds out of your bulbs’ way with the Super-Tough Weeding Knife. 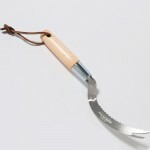 Designed to target hard-to-remove weeds, the weeding knife’s design eliminates pesky plants in your yard, garden, or between your paving stones. As both a garden lover and proponent of stylish utility, there is no doubt that Thomas Jefferson would have appreciated The Shop’s trendy Compost Tin. Jefferson grew more than 330 different varieties of vegetables and herbs, more than 150 varieties of fruit, about 105 species of herbaceous flowers, and a multitude of other trees and shrubbery. He maintained a close study of all of his gardens and always sought to improve his own “rich spot of earth” at Monticello through sustainability experiments and varied cultivation techniques. He studied the recycling of dead and decaying organic matter and its impact on the growth of new plant species, effectively creating his own kinds of fertilizer. Thomas Jefferson once said, “No occupation is so delightful to me as the culture of the earth, and no culture comparable to that of the garden.” You too can culture your garden with our compost box! 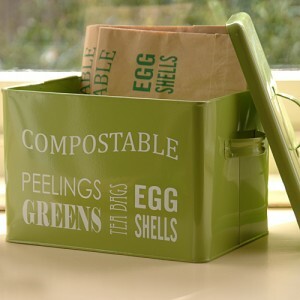 Made of powder-coated steel tin and complete with two kitchen waste liners and a removable tin cover, this tasteful compost box seals out odors while retaining moisture and heat, an essential component of effective composting. Toss in unused fruit and vegetable scraps, eggshells, coffee grounds, plant clippings, and even dryer lint for healthy compost that will fertilize any garden. Compost not only helps condition your soil, but also recycles kitchen waste, introduces beneficial organisms into your garden, and reduces landfill waste. 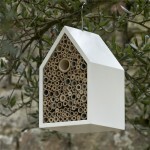 Stick it on your counter, leave it by the back door, or keep it by your garden supplies in the garage. The tin’s compact design allows you to place it anywhere in the house as a decorative and functional tool! 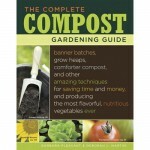 If you’re interested in more information about composting, check out The Complete Compost Gardening Guide and Cover Crops and Compost Crops in Your Garden at The Shop. 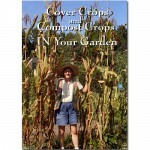 These books detail how you can turn your kitchen waste into healthy soil for your garden and how compost benefits the environment. 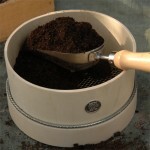 Visit our Farm and Garden section for information about seeds, plants and garden accessories like our Potting Riddle which meshes together soil and compost to create a fine mixture excellent for planting seeds of all kinds.